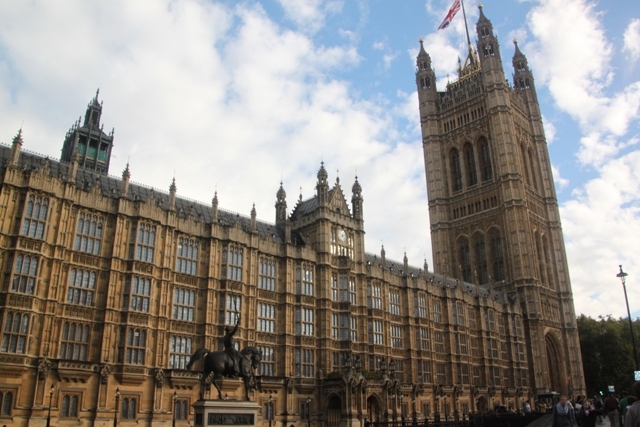 The Palace of Westminster, better known as the Houses of Parliament is possibly in my humble opinion, the greatest of London’s exceptional Victorian buildings. 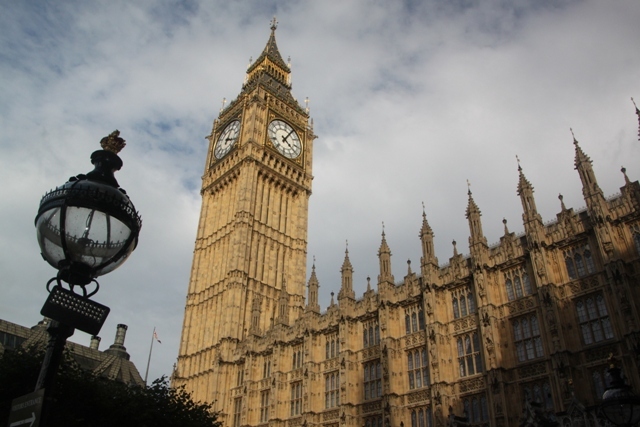 Many a time we have stood in Parliament Square listening to the chimes of Big Ben feeling overawed. Many a time I have imagined going inside and exploring this fine building but we’ve never quite managed it. Until now. Planning a day in London with a morning at the Tower of London, my original agenda was not to have an agenda. The afternoon was to be spent strolling along the Southbank and just going where the fancy took us. The weather put paid to these outdoor plans. Gales and rain, rain and more rain was the forecast (they were right) so back to the drawing board for something indoors. You (obviously) can only take this tour when Parliament is in recess or on a Saturday. The latter for us, I booked the tickets just a few days ahead and had no problems with availability. 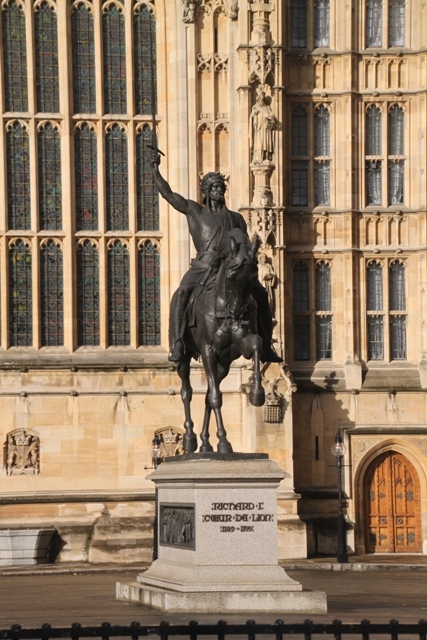 It is a fantastic way to spend just under two hours – one thousand years of history mixed with stunning art and architecture and a sprinkle of modern day politics. Our tour was just after lunch, Son required his by now customary crepe on Westminster Bridge and we had a peek at No 10 Downing Street beforehand. They told us to leave a bit of time to get into the building, airport style security checks can mean delays apparently. We sailed through the scanners in probably ten minutes, but forewarned is forearmed. 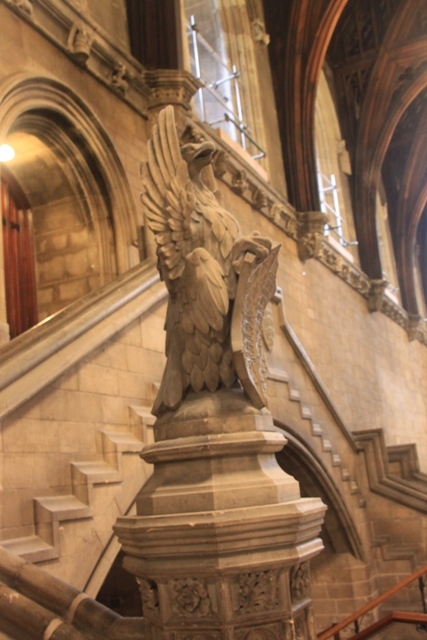 The tour starts and finishes in Westminster Hall and unfortunately that is the only place you are allowed to take photos. That is also just about the only place you are allowed to sit down – plenty of tempting seats and benches but sitting is forbidden in other places and a number of grim faced policemen around the building mean you wouldn’t dare try. Our wonderful tour guide led us through these hallowed corridors and had us spellbound from the word go. We started with the history – the palace is on the site of the original palace from the 11th century, seat of kings and queens until a fire forced Henry VIII to relocate. 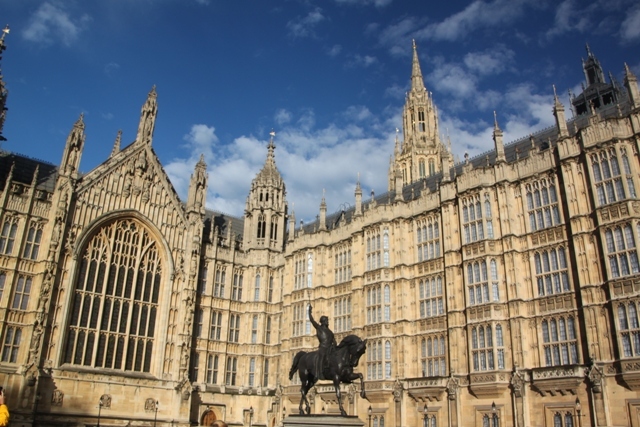 His son didn’t want to live there and gave the building to Parliament in 1547 as a place to live and work. That has been the case ever since. Another fire in 1834 gutted the building, those ingenious Victorians rebuilt it and 1,000 rooms and 30 years later it was done – we have them to thank for what we see today. 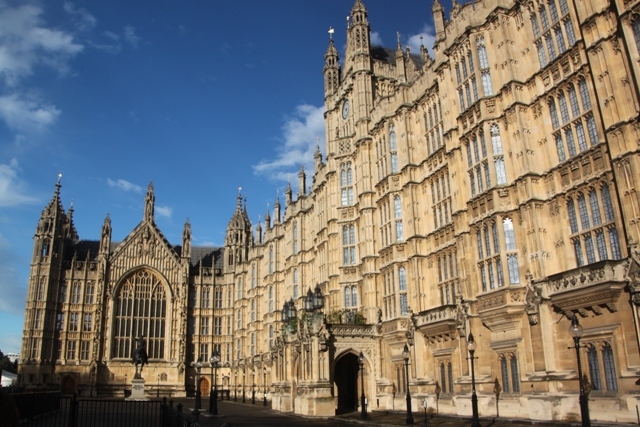 Some interesting places to visit on the tour – we saw where the Queen arrives for the State Opening of Parliament, the magnificent and opulent Lord’s Chamber and Central Lobby where so many political interviews are conducted and televised. Highlight for me though was the Commons Chamber, scene of so many lively debates and where the Prime Minister faces his opposition. We heard about the history and traditions, learned about the rules regarding modern day debates and some anecdotes to boot while standing (definitely not sitting) in the government benches. It was superb and Son was enthralled – he has developed a new found interest in politics and debating. 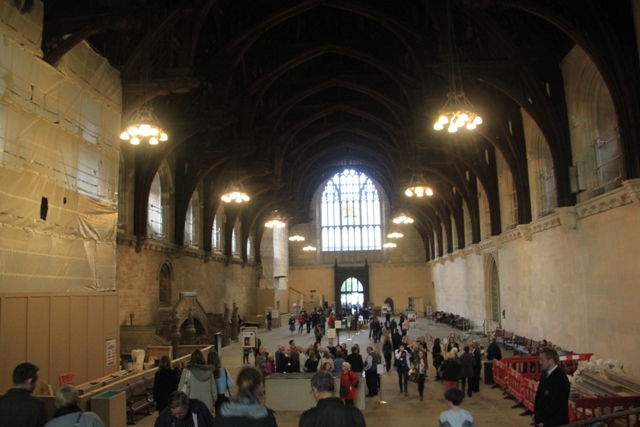 Back through St Stephens Hall to Westminster Hall again and the end of the tour – the time flew by. 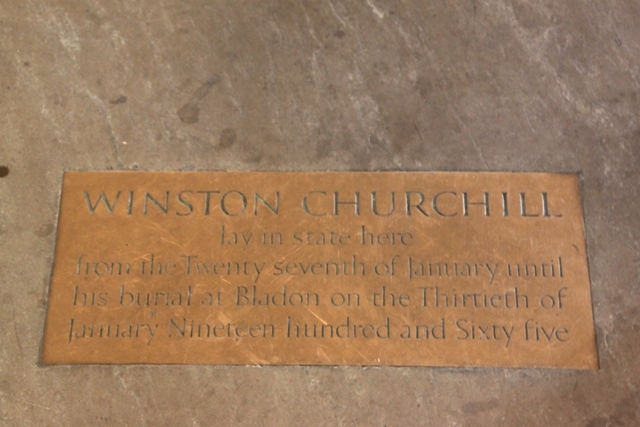 We took time to wander though before we left and found where Winston Churchill lay in state and Nelson Mandela addressed Parliament. Son made the necessary trip to the gift shop – it got a thumbs down – the only one of the whole day though so not an issue. An amazing building, an amazing tour. I’m glad the weather turned bad. You should be able to sit in the galleries while Parliament is in session. I did it before 7/7 and maybe things are stricter now, but I think you just need to queue up. You still can do that – I would love to – maybe on our next trip to London! It’s amazing inside but you’re not allowed to take pictures of the best bits unfortunately!! 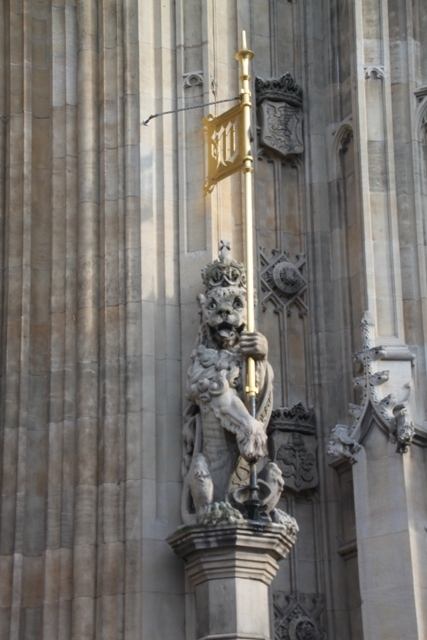 Perhaps the rules have changed given modern security issues but I’ve visited the Lords and Commons when they were in session. 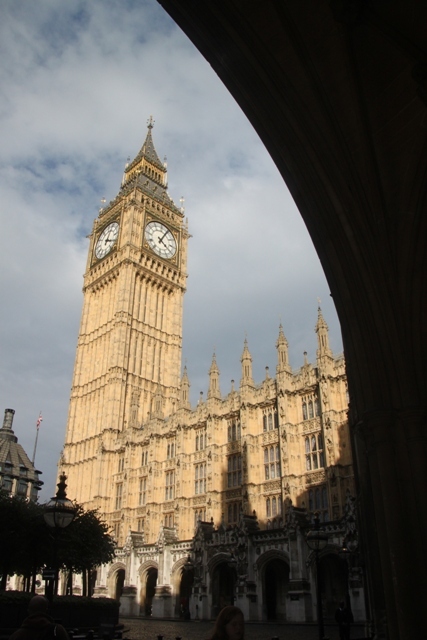 The Lords was hilarious as one chap was droning on while the other five members present were asleep or dozing off. Not a great advert for preserving an unelected chamber! Your photographs are lovely. The architecture is quite staggering. 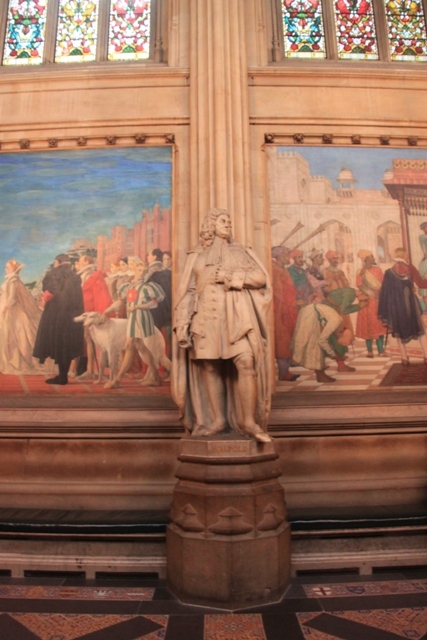 When he worked for the NAO, my husband actually used to dine in Westminster Hall from time to time. 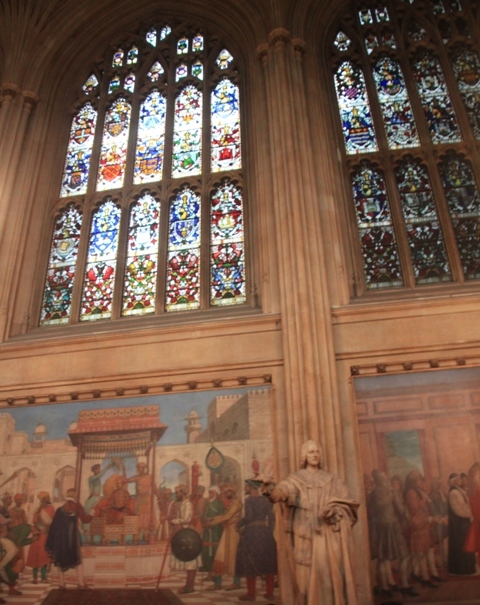 Dining in Westminster Hall, that’s something really special, I’m very jealous. 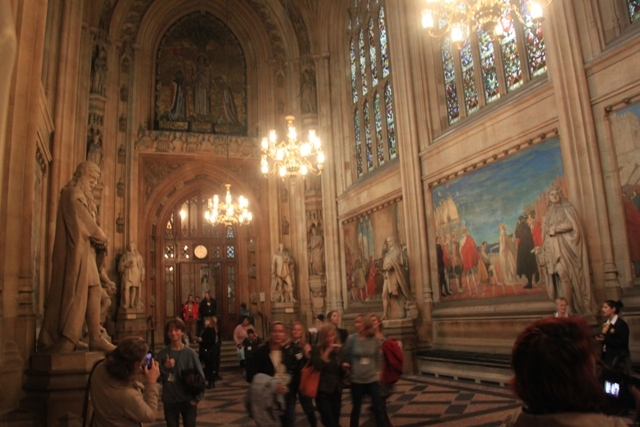 You can still queue to get into the Lords and Commons, something I’m determined to do on our next visit to London! It was fascinating Rosemary, we all loved it and I highly recommend if ever you have some spare time in London. The Reichstag must have been equally absorbing, that sounds right up my street too and definitely one for the ever growing list!! Have a great weekend. Thanks Joy I might be able to do it next year as planning to spend a few days in London when next over in the UK in April! I did a post about the Reichstag Tour a while ago under “German Travels” it’s well worth doing if you’re in Berlin (you do have to pre book). Have a great weekend too! If you ever find yourself back in London I highly recommend, it is so interesting and a great experience. I was looking at their tours but I don’t think I can manage. So thanks for the virtual tour! It really is a magnificent building! A beautiful building inside and out, we all loved our visit! I usually don’t do tours but now I’m thinking I should the next time we are in London participate in that one! Interesting! I definitely recommend it – even if you’re not a tour type this one is different. You get to see inside the most beautiful, historic building where huge decisions are debated and taken and it us absolutely fascinating. Being from America, I am not that familiar with the way politics and legislature works in the UK. This would be a fascinating tour! There were so many fascinating traditions and things we never knew about too and lots of American people on our tour, definitely recommend if you are in London. Thank you Kamila, hope your weekend is a good one too! We’ve looked and admired from the outside many times so it was great to see the inside this time, it did not disappoint! Got that shot of Big Ben just as we were leaving. Made up for not being able to take pictures on the tour. So neat! What an experience! Thanks for sharing! It was such an interesting and memorable thing to do, we all loved it. Loved reading this post! I think I will look into the tour for my upcoming trip to England. We really enjoyed the tour – great to see the inside of this incredible building and all the history and traditions were explained in a fascinating way. Would definitely recommend. Thanks for coming along Lucy. It is a beautiful building inside and out with so much fascinating history. 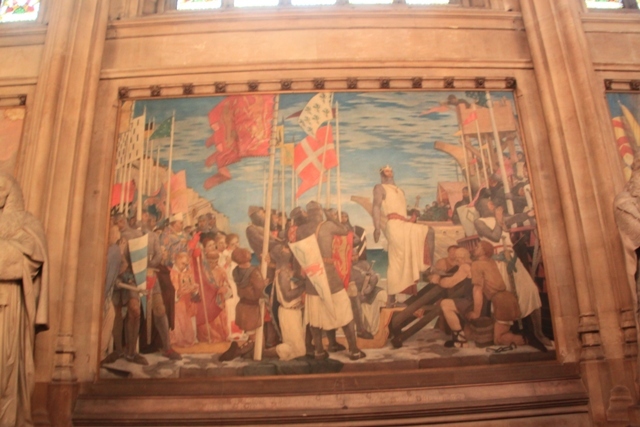 We were engrossed and loved the tour – definitely recommend it if you get the chance!